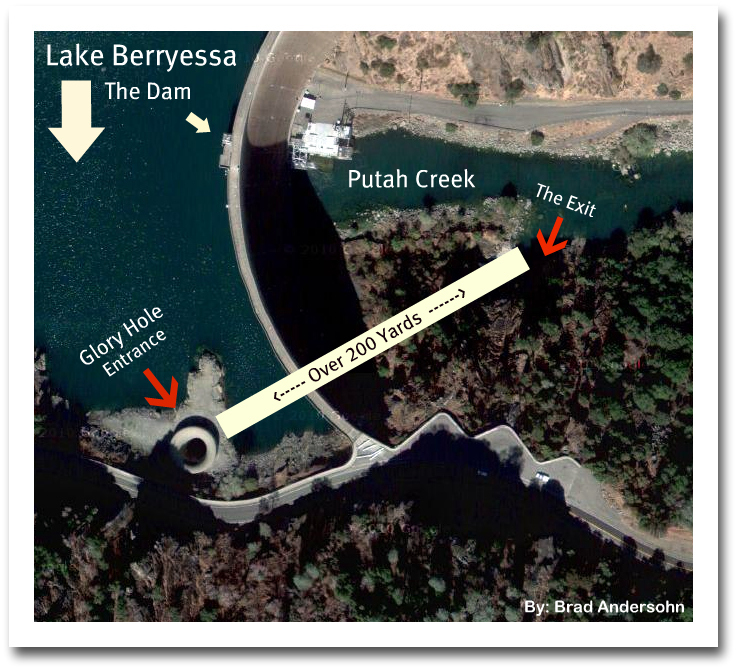 This is the true story of the Glory Hole in Lake Berryessa. It is very rare to catch and watch the “Glory Hole” working in action due to the fact that Lake Berryessa must be so full that the “Glory Hole” spillover begins to dump the excess water into the creek on the other side of the dam known as “Putah Creek.” Naturally the names Glory Hole and Putah Creek have had numerous comments made with a play on words, but the fact remains that it is what it is and it IS REAL. The 13 second video on Youtube that has garnished over 49,000,000 million views was shot with a simple Flip Video camera while standing on the edge of the lake. It is an amazing thing to see, hear, and witness with your own eyes. Some will say it’s fake, possible CGI or Photoshopped, others who have been there will tell you that it is very real and in fact is one of the most incredible things you’ll ever see. At first glance, one will begin to wonder about the fish and the ducks that might accidentally end up going down the drain that drops out a few hundred yards away on the other side of the dam. Many question whether they would live of not? Then there’s the thought of boats, people, and other living things that might end up getting caught in the currents, this has many thinking and wondering about it for hours?!? Wondering Yourself? Many of the 26,500 comments on this video have been about how this scares the heck outta folks as they watch it. Though the largest percentage of comments will have something to do with “dividing by zero” or “throwing celebrities and others in it” or “some kind of pornographic innuendo“, it’s really the millions that don’t comment that is most impressive. Simply put, there is an extremely eery and mystic element that surrounds the Glory Hole. It’s truly been an exciting time to watch this video get exposed to millions of people who may never get to see this place in person and even if they do, they will most likely never get to see the Glory Hole in action as seen in the video below. It’s an honor and privilege to have captured this on film and a true blessing to share it with others like you. ADDED ON 1/1/16 – This photo was just taken on New Year’s Day 2016. 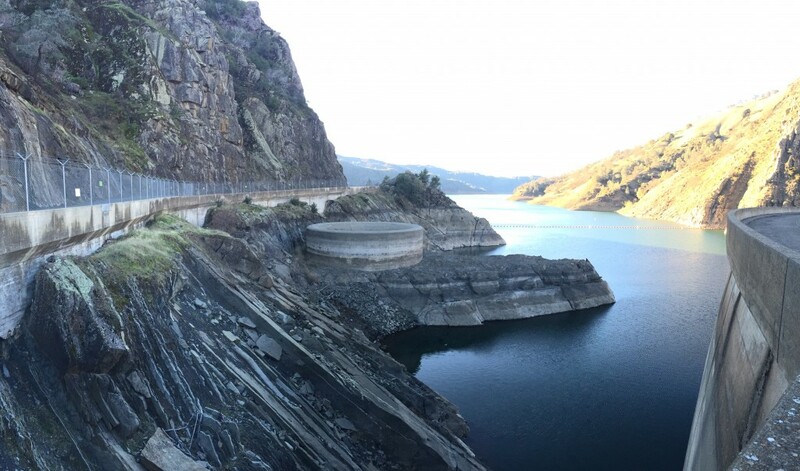 As you can see, Lake Berryessa is lower than it’s ever been since the video above was taken. 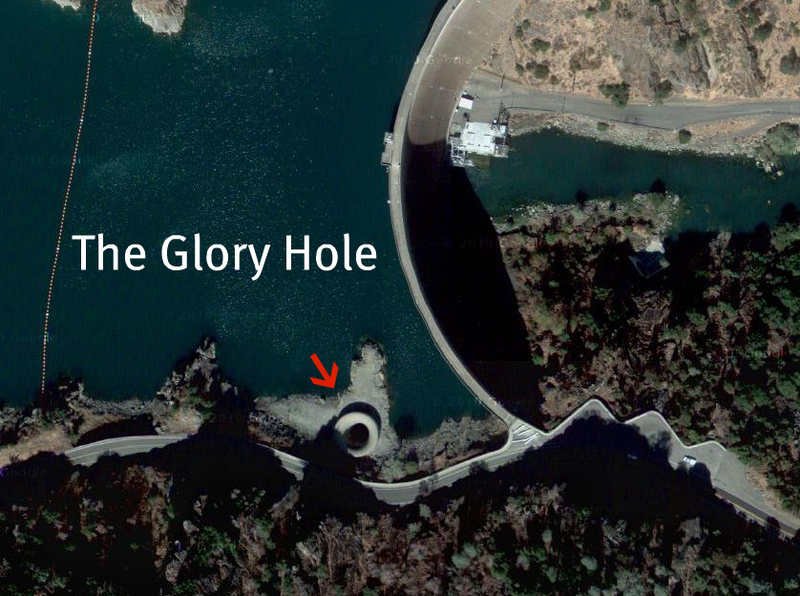 More details and information has been made available about the Glory hole. Many years ago I remember the log jam that is across the lake in front of the dam itself came loose on the far end and went down the Glory Hole. That was a site to see. WOW! I can imagine. I bet with all the rain we’re having (even right now) the Glory Hole is probably running as we speak. I may take a drive up there today to check it out. Alfonso, I do too. This video is now averaging 100K views per day and has been featured on multiple TV shows. What makes it so spectacular in my opinion is that it hasn’t been active since this video was shot and until this lake floods again, it won’t ever get to be seen “LIVE” as it is shown here in the video. Talk about being in the right place at the right time!?! Are you local or were you just visiting? 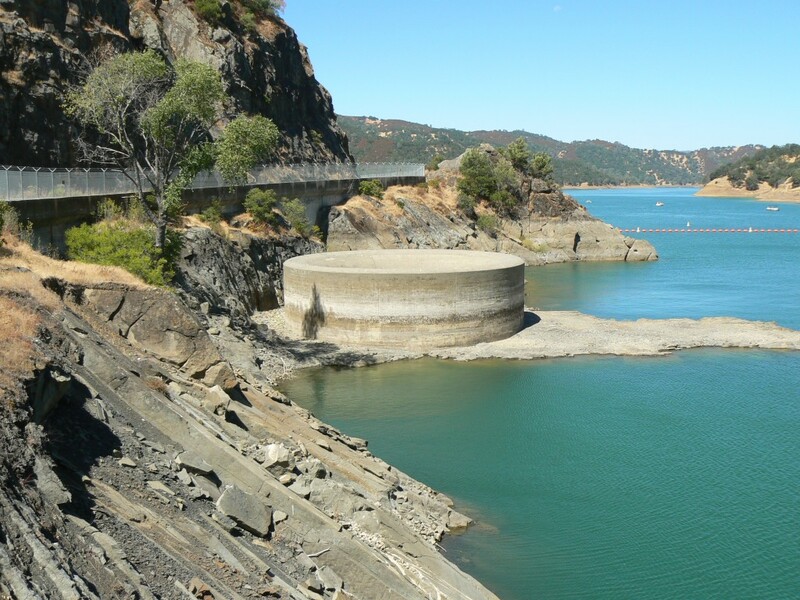 I grew up at Lake Berryessa, lived there from 1982-1995. I have only recently moved back up to the SF Bay Area after moving to SoCal in 1995. Last night it occurred to me to show my kiddos pics of where I grew up and to see if there were any good pics/vids of the “Glory Hole” that I have talked about often as it haunted my childhood nightmares. I was completely shocked to find the water levels had dropped so much. In the event that you are not local, let me assure you that the video you took was actually very mild in comparison to what it was like when I lived there. Over 35,024,197 million views, 20,490 comments, 10,014 likes, 1,851 dislikes, with 211 reactions and it’s been Favorited 7862 times. This terrifies me on a completely primal level. I can’t imagine how disorienting the noise must be. NOTHING would get me to go into that lake at all. I live on the east coast. When one is swimming in a place like Ocean City, Maryland, one knows they’ve gone out too far, because the temperature of the water drops, quickly. I dislike the Grand Canyon, Niagara Falls and the Glass Box in the Sears building in Chicago. The theory in my family is that when my mother was pregnant with me, she visited all those places and transferred her fear of falling to me! Frankly, I think places like this tap into the medulla oblongata in the human brain to activate a fear response that keeps most of us from doing really stupid things. I have been to this location many many times. Back around 2002/2003 I totaled my car driving around the turns leading up to this location. I was driving too fast and it was wet/rainy and I lost control, spinning the car 180 degrees and slamming the back end of the car into the rock wall across from this spot. If I had known that there would have been so much attention to the glory hole, I would have shot a video as well. I remember the first time I saw it, I couldn’t believe that it was just an open hole for someone to accidentally swim into… Anyway, it’s been several years since I’ve visited this location and I suddenly have new inspiration to head out there. Thanks for the video. Absolutely freaking terrifying!! I found myself holding my breath as I watched. And, how in the world is that person staying on his bike in the other picture? It looks to be totally vertical or pretty close to it. Do you know if people can repel into it when the water is low? Water or no water, this is not a place or something you’d ever want to repel. possibly not the same one though! There’s something about this that is completely horrifying to me. It just evokes such a feeling of completely irrational terror. I’m not afraid of the water, I swim well, never been afraid on boats but there’s something about seeing a giant hole in the water that scares the crap out of me. It’s not something on a mental level but more like a purely gut reaction. That said, it’s still something I’d love to see in person. It’s something truly awesome and terrifying. Wriggle – To be perfectly honest, while shooting this video (and being right next to it), it was pretty awesome and yet terrifying at the same time. It was so loud and surreal that I only shot 13 seconds of it before I ran down the hill to get the rest of my family and show them too. It hasn’t run again since that day when we discovered it. I completely agree with you. I had the same exact reaction. Horror. I too can swim well but it is the essence of being sucked into this huge gaping whirlpool that literally shakes me to the core. Nonetheless, it is fascinating to watch. It would be a death defying act to survive the glory hole for sure!! I would go down for a billion dollars if there were medical professionals waiting for me at the other end who could guarantee I’ll survive. Also, another student at my school says that he’ll take on the Hole of Death (that’s what we call it) for a billion dollars, if he was guaranteed to survive. He said that he’ll also hang on the edge (with a rope) and feel the suction for 20 minutes, for 10 million dollars, saying “as long as they pull me back out”, but he said he’ll do anything for a BILLION. I wonder if all of these people who say that they’re terrified of it would reconsider if they were guaranteed to survive, and offered a BILLION dollars. There were also numerous people who I spoke to who were ex-military who said that they were drowned and revived in their training, and the compensation was pitiful. Meanwhile, if I did take on the Hole of Death (and that’s the correct name for it) would I experience the total drownage or do you think I’d be knocked unconscious by the forces? Also, I wouldn’t hang on the edge and feel the suction. I would want to GO DOWN and get it over with! This is amazing. When I saw the video on youtube, I was wondering where the water was going… I’m actually glad to have seen your picture, with the details. What would’ve happened if you fell in the water, from the place you were standing? And how loud do you think it was? Could you see where the water was going? @Tristan – There is no way to fall into the water. There is a chain-link fence all along the road with a double (Y-shaped) barbed wired top. If you are standing on the dam I guess it is technically possible to jump from there but the sides of the dam walkway are pretty high. I am 5’3″ and the side wall is at about my chest. You would have to intentionally jump over the dam (probably preferable to climbing a barbed-wire fence to actually get near it from where it was filmed. A MUCH more dangerous position (when it is flowing) is to be in the water (swimming, boating, etc) anywhere near the bouy line. I grew up at Lake Berryessa and we would always dare each other to jet ski closer and closer to the line. I never went on that side of the lake, that thing was never dry when I lived there and it terrifed me. What most people don’t truly appreciate from the video is just how LOUD it is. What sounds like noise wind in a camera mic isn’t, the thing is really that loud. When it is going in full force from where this video was taken, you would have to shout to the person standing next to you to be heard. @JaelynRae – your description is dead-on accurate. (no pun intended) When I shot this video, it was so loud I had to yell over the sound of the water gushing down that water release tube. This video (like any video or photo) does NOT give the true perspective on the power or magnitude of this thing like it does when you’re standing right next to it. It is very creepy and almost haunting to be this close and witnessing the power the glory hole harnesses. 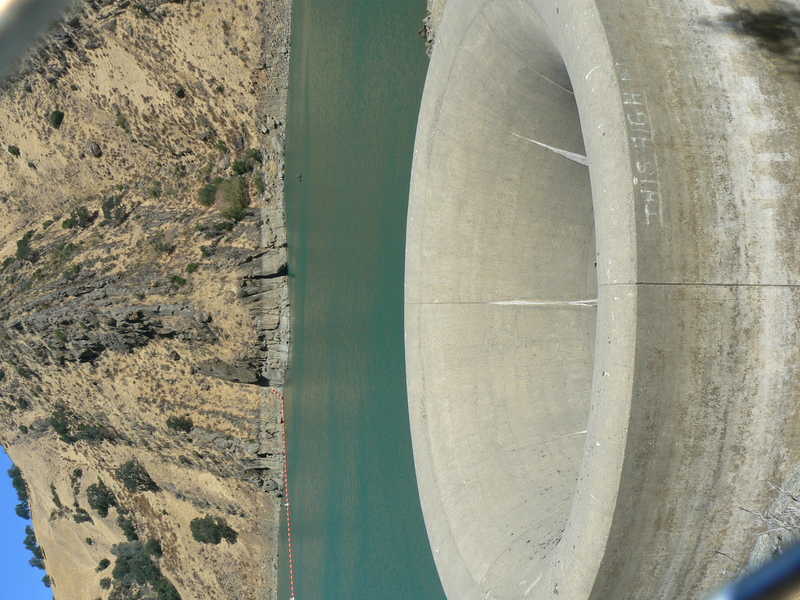 The water levels have not risen in Lake Berryessa to this height since, but when it does once again, the glory hole will be witnessed and “heard” by those fortunate enough to get this close and see it for themselves. My parents live a short drive from there outside of Winters. I have seen the glory hole overflow many times and it is impressive. It should be noted though that it is fenced off from the rest of the lake and it would be hard to accidentally go down the hole. I used to go for runs in Stebbins Canyon which is very close to this location. 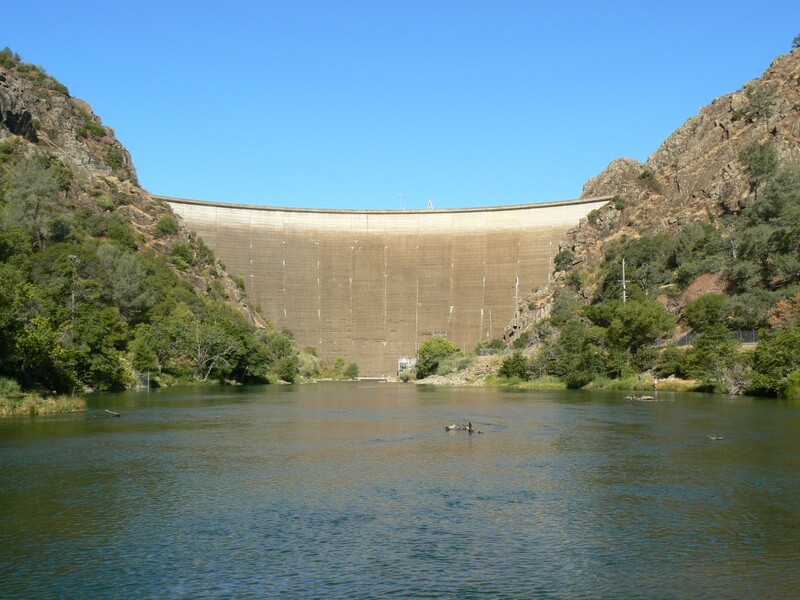 I would often park near the glory hole, if it was overflowing, and run a short distance down the highway to Stebbins Canyon just so I could see it a couple of times during my outing. Would you know about this? Prepare for that which is truly eerie. A chill to your very core. Well i’m glad that it’s fencedoff 🙂 if not then that would be scary as ****! i had butterflies when i watched the video! @Zeather – I may be fenced off from the road but it is defintely accessible from the lake itself. There is only a bouy line “barrier”. I grew up in Lake Berryessa and spent nearly every day in the water but I flat out refused to even go on that side of the lake. I spent my time on the opposite shore a safe 35 miles away. When flowing in full force it is indescribably terrifying. In this video the water level is actually a little low, you can see the rim of the pipe through the water and it is falling the hole somewhat “slowly” in comparison. When the lake is truly full, the water gushes in with such force it froths and you cannot see a hole in the middle. Oh my gosh..this was so scary for me to see. I’m not a good swimmer, but I can swim enough that I don’t drown in a poo or anything but even when I was a little kid, pool drains freaked me out, they still do!! So watching this really freaks me out..especially seeing the guy on the bike inside the hole..Oh man..thanks for sharing this with us, but still a very terrifying hole!! Yeah, drowning in poo would be a horrible way to go, lol. …and yet you were named after a dishwashing soap. I was just telling some one about this place!! I used to go boating with friend as a child on this lake in the early 80’s. I had no idea that hole had a name, but every time I have thought about it over the years it has given me chills. I don’t remember it being fenced when I was a child, and I never knew that it was part of a dam, or I forgot that. It’s crazy to see that video. That thing really scared the crap out of me! It took a lot of guts for me to read this article and watch the video, but I cowboyed up and did it. The name Glory Hole brings tightening in my chest and abs. I breakout in anxiety. I really fear this thing. I hate the words and seeing the thing, but I did it because I wanted to just see it and get it over with. When going up to the lake I fear seeing it, but from the roadbed you can’t. The only thing else I fear this much is crossing the Golden Gate Bridge, or that bridge that crosses that canyon in Colorado. It’s over 1000 feet high. Erk! I remember reading an article in the Reporter about a woman who got too close to the event horizon and went over. Scares me to think about that. You are right, there is something eerie and frightening about the Glory Hole. But, I would still like to know how it was built. Ladies and Gentlemen, here is an earth bound, man-made black hole. A true black hole. But I don’t know how far out the event horizon is, so stay out! was relieved to discover the tips by this posting. The only way you could survive is to be thrown in under the best conditions around April 30, 1988. That is an estimation. Then you’d have to have a real hard head that had been hit before. Your way of thinking would have to be different from other people’s. In other words it would help if you could lose touch with reality and think you were a fish and then a rocket. Instead of trying to swim, you would have to already know how to float very well. Instead of swimming in the pool like other people you would have been the one who looked funny floating around. You’d have had a near drowing experience before and have made your peace with God. You’d be sunburnt looking and scraped up and maybe your appendix had burst. Water would keep pouring out your ears. Your hair would be prone to fall out and you’d be combing a lot of glass and stuff out as time went on. You’d have that tired after swimming feeling. You’d have a dent in your head. Your government would try to hide it from you for 25 years. The lady at lake Berryessa would be calling your house to tell you their insurance doesn’t cover it. You would have amnesia that would take a long time to wear off. If you were lucky you’d have kids waiting on you at home so you wouldn’t be able lay down and die afterwards. You would be told you were crazy and then that you weren’t crazy. Your body would be shocked into not having normal periods (female problems). Then you’d recover from that. You’d attract the attention of people associated with or the actual Zodiac Killer himself. (Geroge Hodel). It would take 20 years of nightmares and flashbacks to temember part 2 and 5 more years to remember part 3. I just don’t remember falling in yet. I know that nobody is ever going to believe me so I have to go on with my life. No, you can’t possibly imagine what it would be like to survive the spillway. I was an Army wife and the risk analysis was done the same year. It was a low probability/high consequence event. No one ever was prepared for a survivor and they sure didn’t want to deal with it. I would have demanded a grate. You have got wonderful stuff here. be one of the very best in its field. Superb blog! I don’t understand how someone could die from it. I guess its possible but drowning seems impossible in my eyes. There is clearly a hole in the water, meaning that there is air flow, but I think the drop would kill you rather than drowning. Because that would be one fking awesome theme park ride if they could make you live through it. But yeah, I find hit extremely hard to believe you would drowned if you fell into it during the time the video was taken place. I have been down inside the exit tube to see the entire tube. Emily had to have been killed by 200+ ft fall to cement before being washed out the other side. The big questions are: 1. How did she get down there to swim at that area? (its completely secured by fence & barbed wire) 2. What would a 42 yr. old woman working on her PHD at Davis be doing down there? If it was a suicide attempt, why would she hang on for 20 mins? (changed her mind)? I can not imagine any reason she would be there swimming. Like most people, when I saw a “glory hole” in a lake (Whiskey Town) for the first time at about age ten I was terrified by my own imagination of what would happen if you got sucked into it. Who would ever dare death by even contemplating swimming near a glory hole when water was flowing into it? I would like to ask Emily one question: Why were you there? 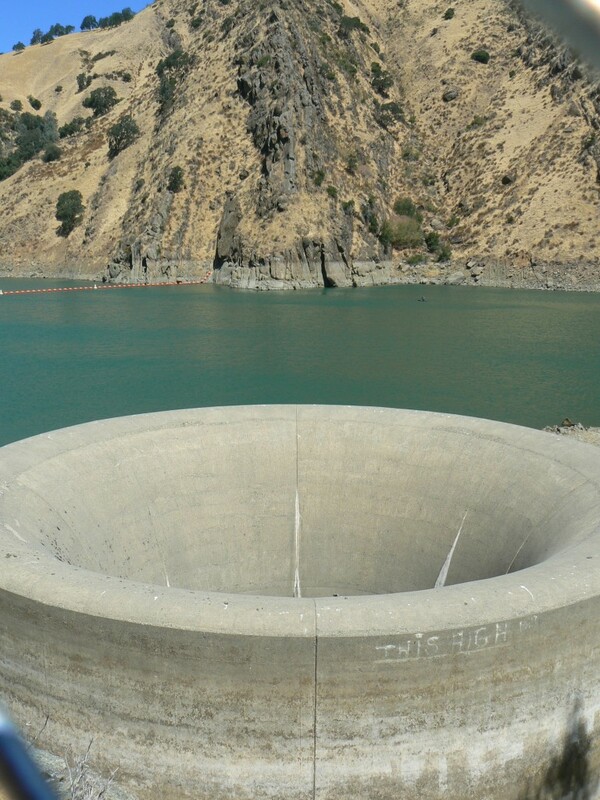 It’s been raining soooo much in the Bay Area, we are going to drive up there today to see if the Glory Hole is running once again after the many many years it’s been all dried up. 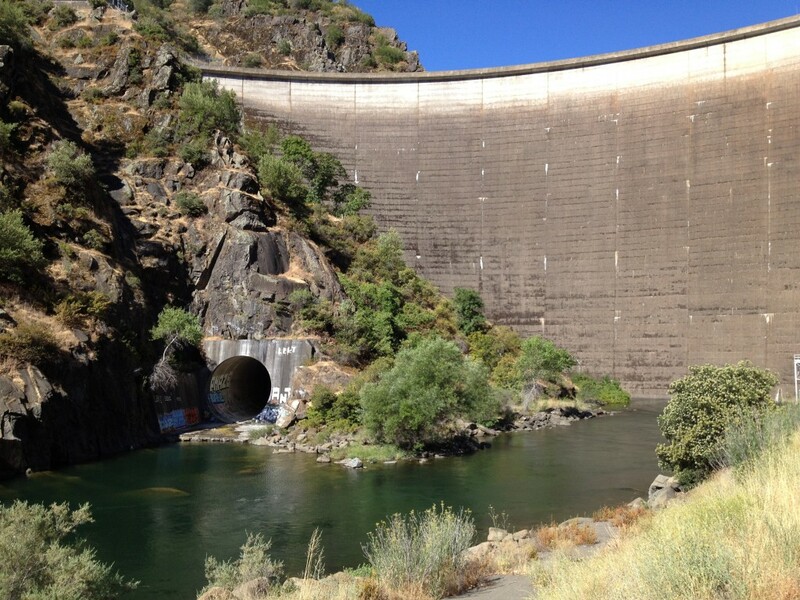 I was on the sales team at Berryessa 45+ years ago and this is quite a site……..always loved the area. The lake is over 20,000 acres (80 km?) when full. It is approximately 25 km (15.5 miles) long but only 5 km (3 miles) wide. It has approximately 265 km (165 miles) of shoreline.